Are you looking for a bundle to help with explaining CBT and helping reinforce coping skills? This bundle is filled with ready to use activities: coloring activities, workbooks, homework, feelings charts and stories. 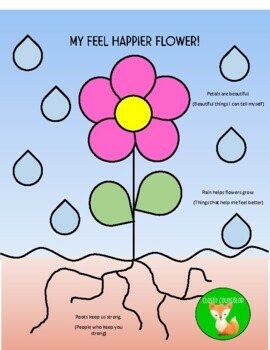 This flower is a great way to identify the supports a young or older child has. 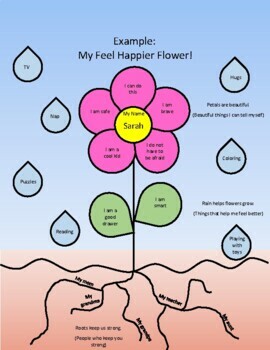 Using the metaphor of a flower, talking about coping skills is non-threatening. This 1 page worksheet/ activity includes a spot for coping skills, social support and positive self-talk. 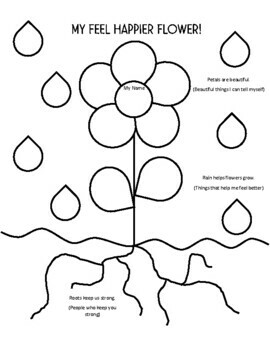 This could be adapted to be created with construction paper if the time allows. This first page of this is an example of how to utilize this tool.